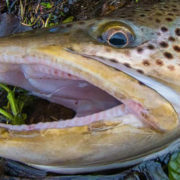 Photo by Ed McCoy of a Michigan Brown Trout snacking on one of his new mouse patterns. Thanks for sharing the pic Ed. Nice work.